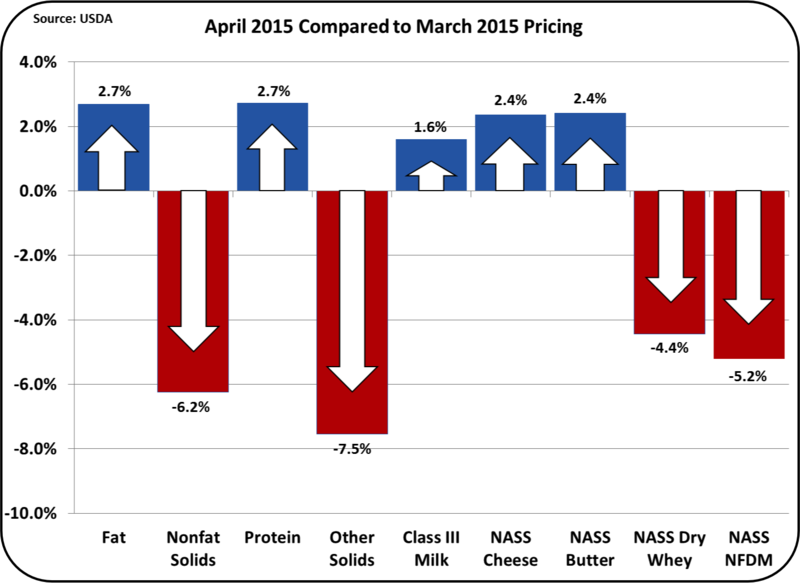 On April 29, 2015, the Class and Component milk prices for April were announced. The pricing was positive, although the changes were small. The Class III milk price was up 1.6% on stronger cheese and butter prices. 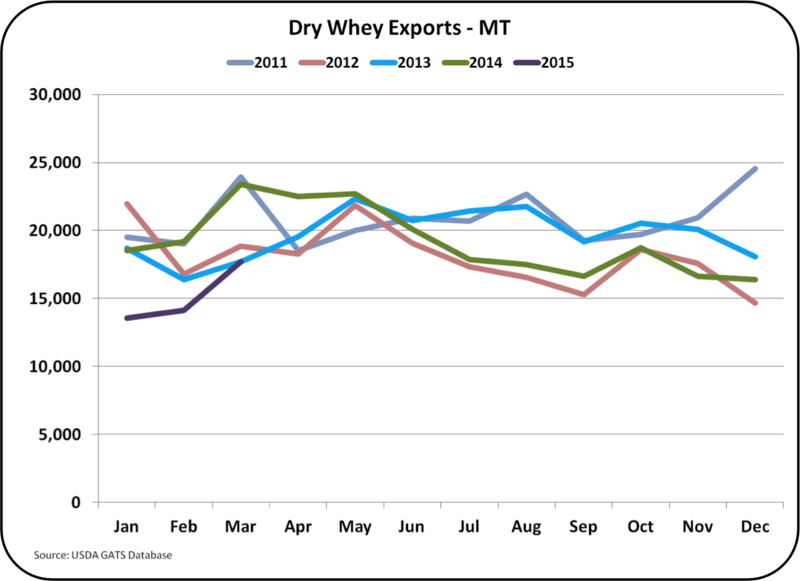 Dry whey prices, which are very dependent on the international market were down causing a decrease in the value of other solids. As a result, the portion of the Class III price attributable to Other Solids decreased by 1% with butterfat ticking up by 1%. Milk protein continues to provide the largest piece of the milk check with a value of $2.56/lb. compared to $1.89/lb. for butter and $.27/lb. for other solids. 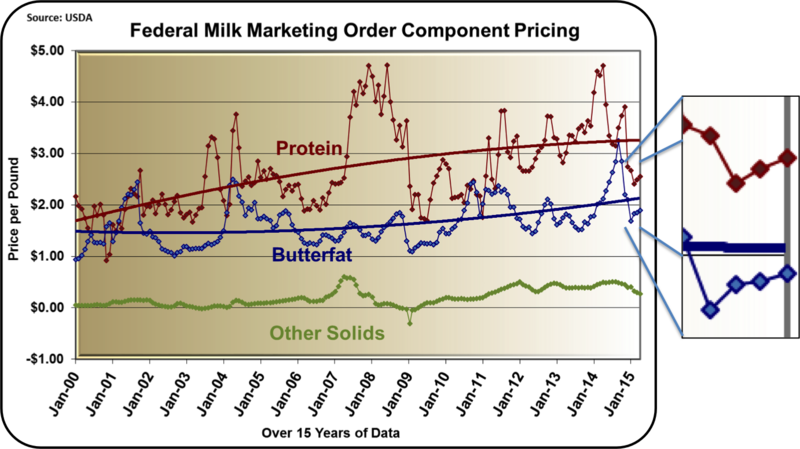 The increase in the Class III price and the increases in the value of milk protein and butterfat are positive movements, but in view of the long term trends, the changes are small. 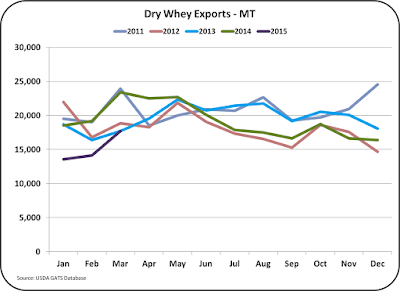 Milk protein is still running well below the long term pricing trend. 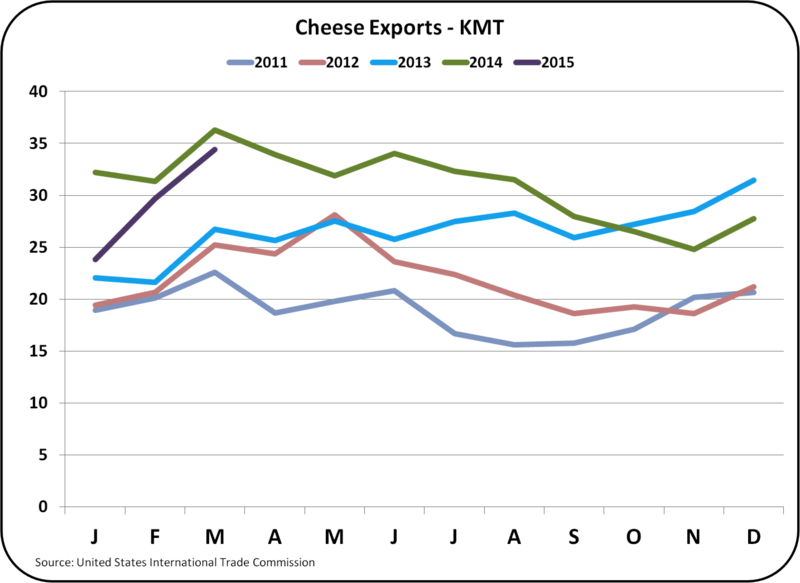 The good news is that the concerns about falling exports of cheese causing inventory increases and falling prices are being diminished. 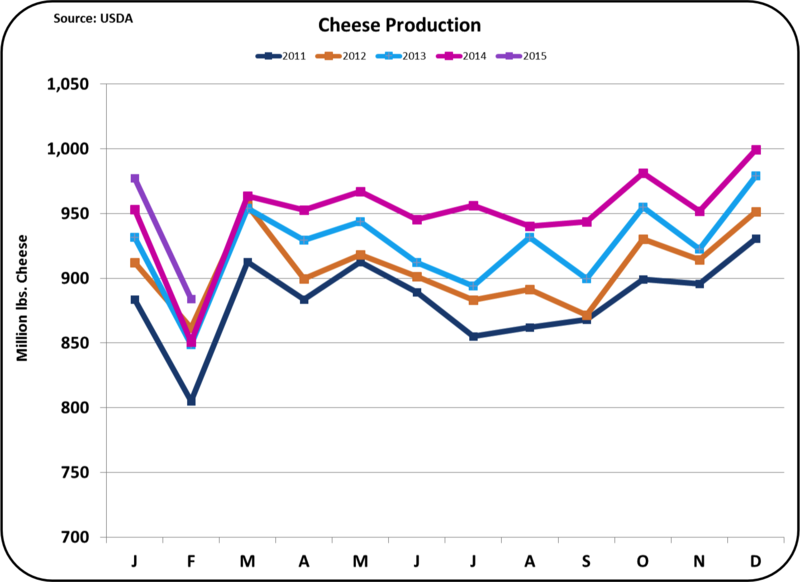 Inventories of cheese are staying in line with historical levels and futures prices for cheese are improving. 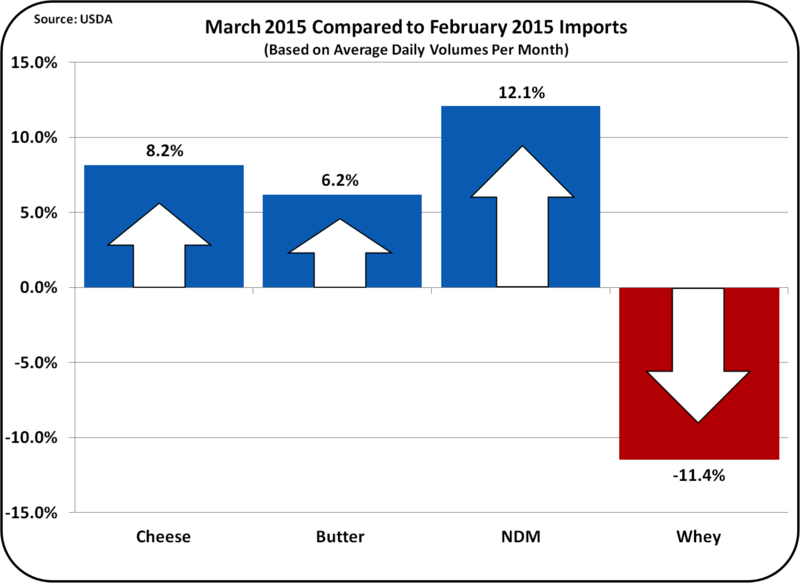 Butter inventories continue to be tight with low churning volumes. 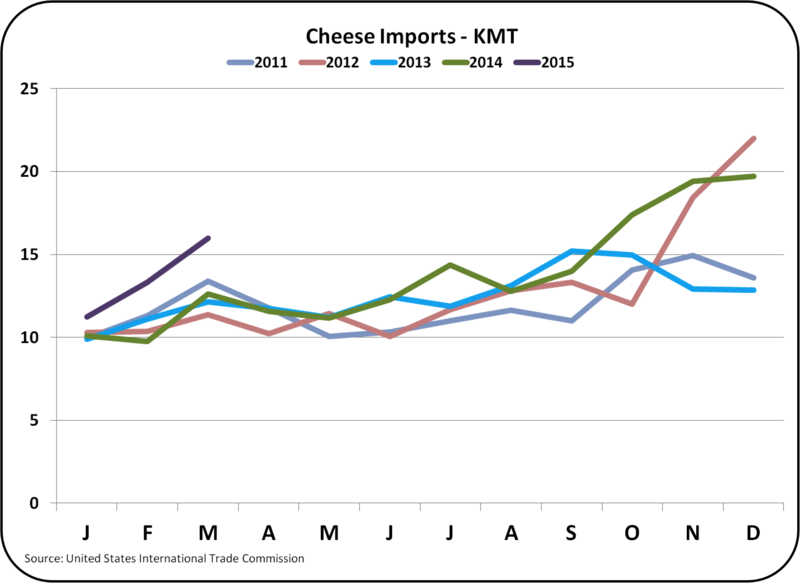 Cheese pricing is closely tied to the Class III milk price. 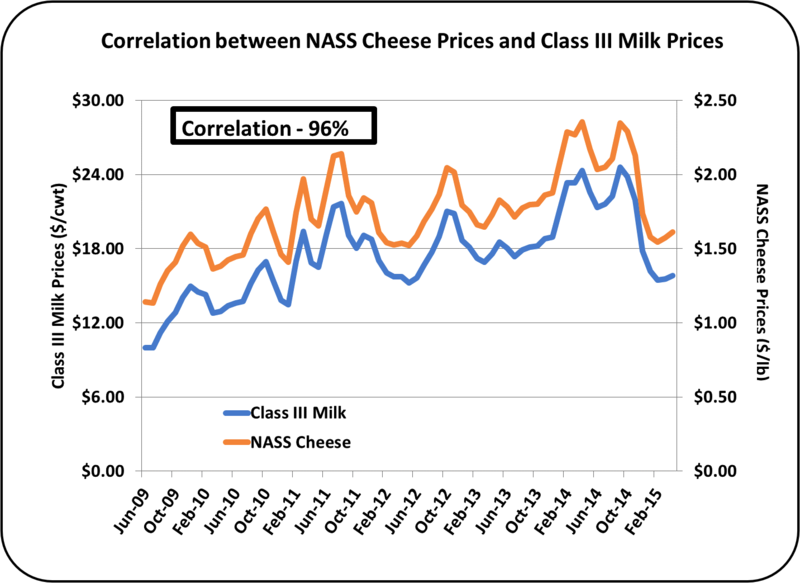 The chart below shows the relationship, which has a 96% correlation, meaning that if you know the price of cheese, you will be 96% accurate in predicting the price of Class III milk. 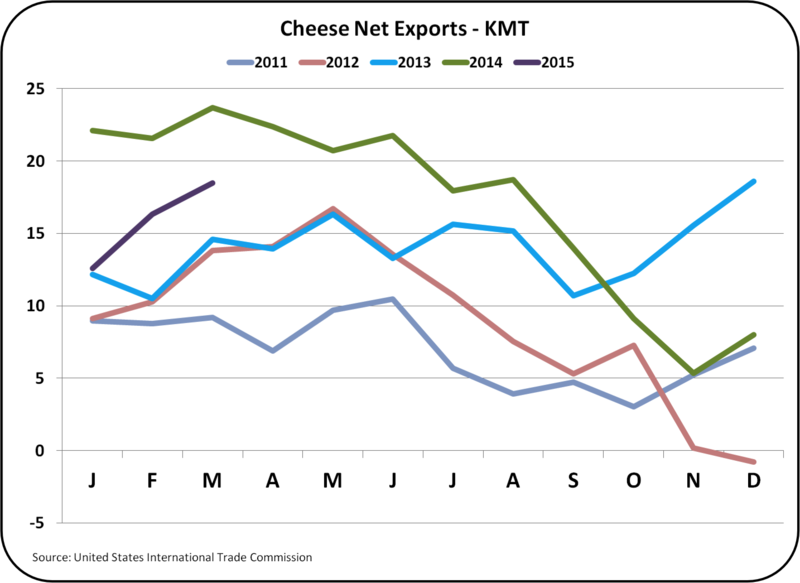 The large drop in the price of cheese and milk, compared to the 2014 highs, has to do with export concerns. 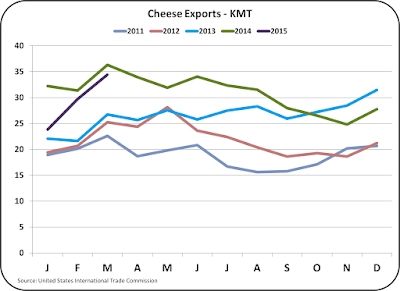 The USD has been very strong which makes U.S. products more expensive on the international markets compared to other cheese exporting countries. 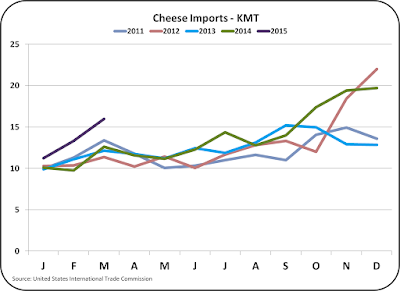 Currently about 6% to 8% of U.S. produced cheese is exported. 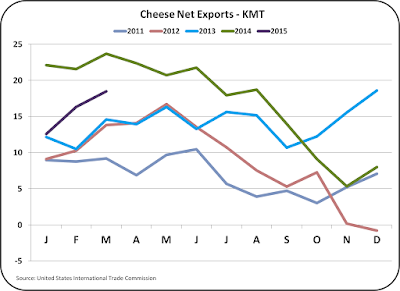 If cheese exports drop suddenly, there could be a U.S. glut of cheese that would reduce prices. 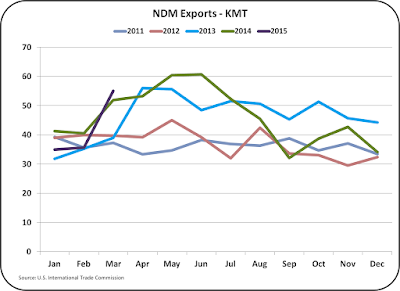 See the prior post to this blog for more details on exports. This concern seems to be diminishing as the futures market is now strengthening. The April NASS price of cheese was $1.61/lb., the highest value in 2015. The CME futures show cheese increasing to $1.80/lb. by the end of the year. This would still be well below the $2.35/lb. peak price in 2014. 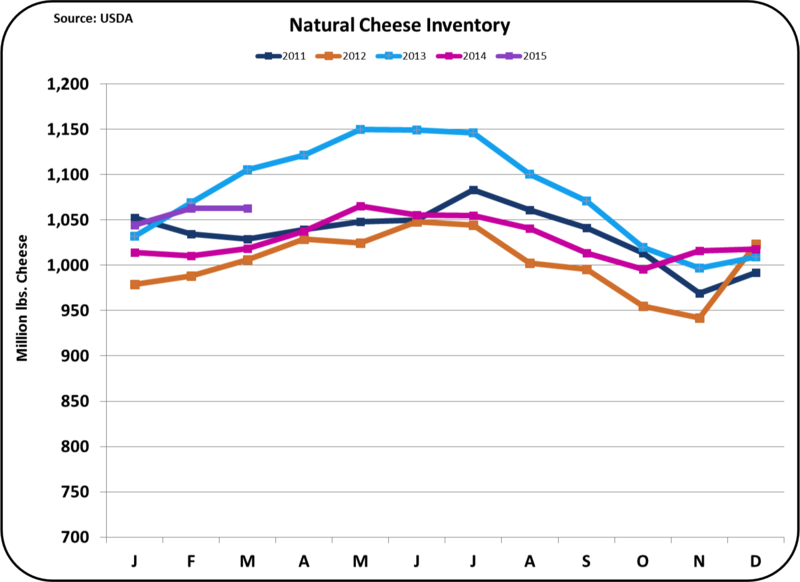 Inventories of cheese do not appear to developing a significant glut. 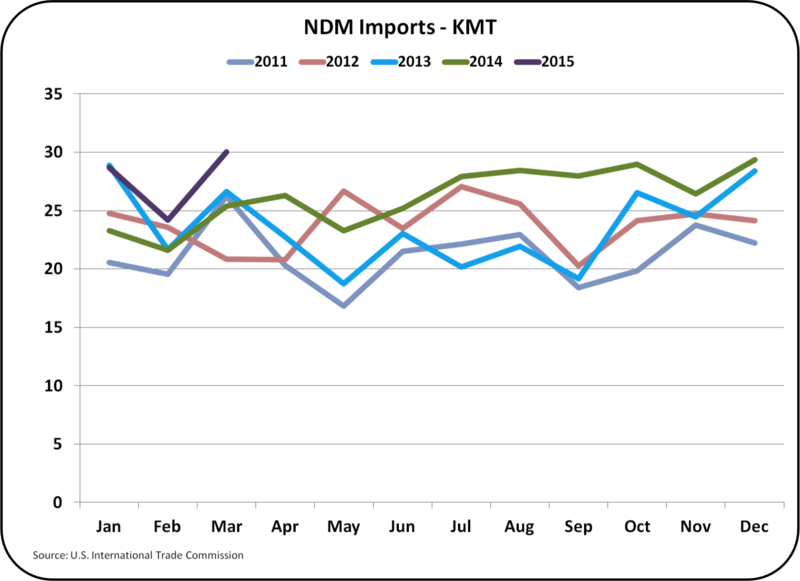 The chart below shows the most current data for natural and processed American cheese. Butter prices remain relatively high at $1.74/lb. reflecting the tight inventory levels shown below. 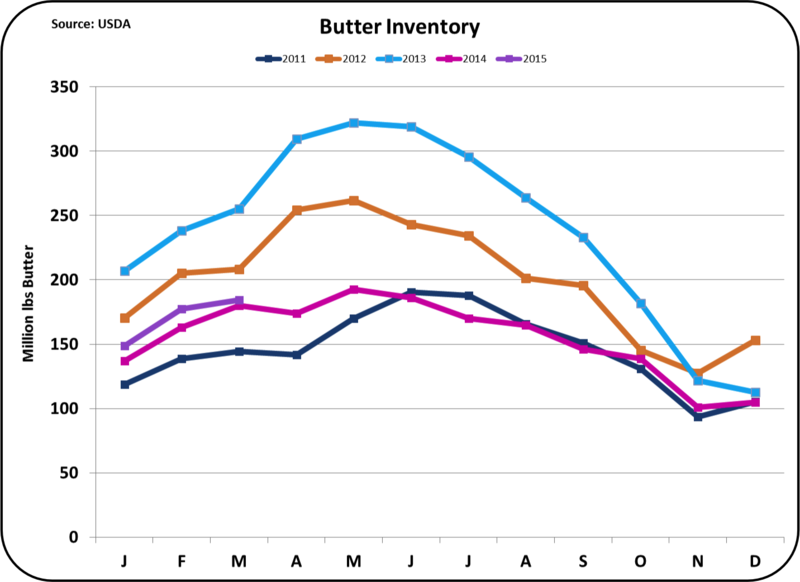 The low inventory levels are caused by two factors, very high exports in late 2013 and early 2014, and contracted churning of butter. 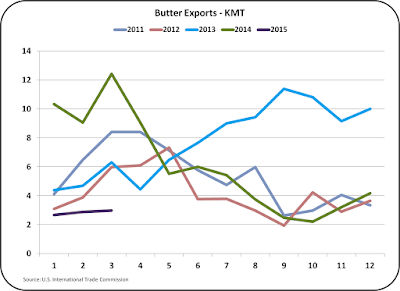 Butter exports have now fallen to the lowest levels in five years, which has allowed a slight recovery in butter stocks. However, the biggest factor for the low inventories is the reduced churning levels. 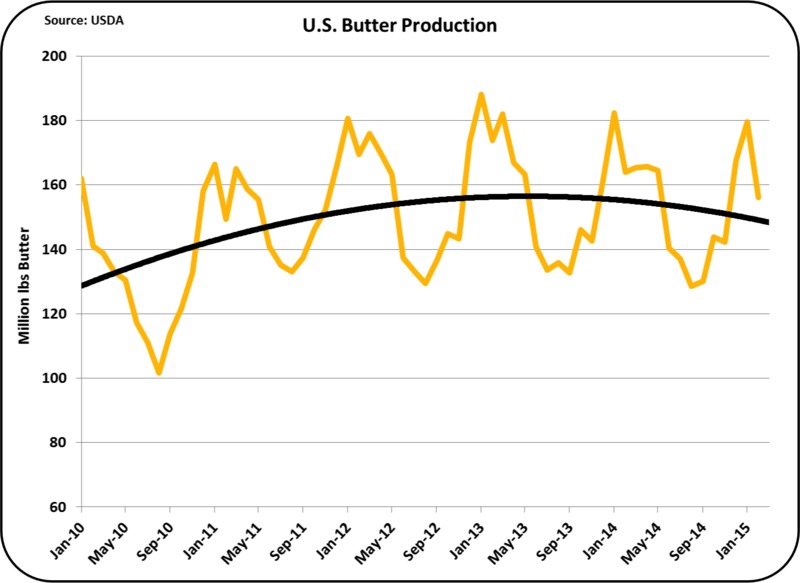 Butter churned in 2014 was .3% percent below 2013 levels. So far in 2015, the same scenario continues. California produces one third of the U.S. butter, largely because of the huge volume of nonfat dry milk produced for export. Butterfat is the co-product left when making nonfat dry milk. The majority of this butterfat is churned into butter. 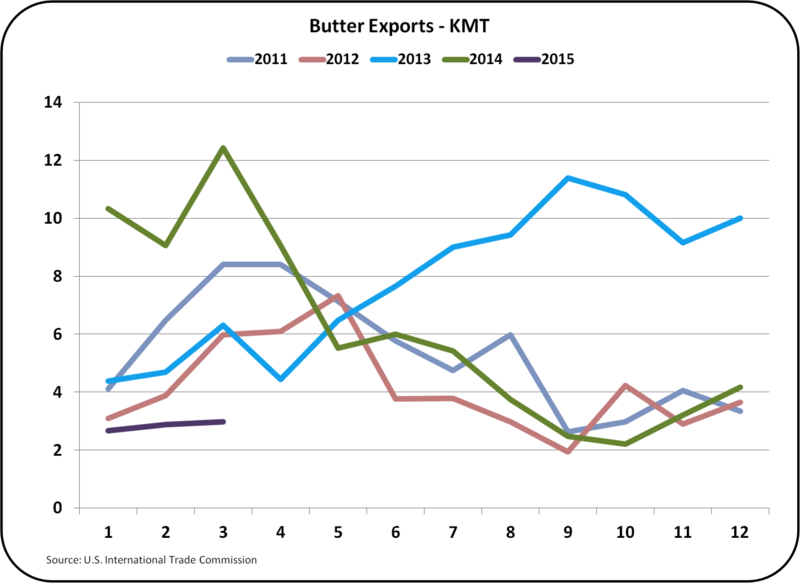 With the exports of nonfat dry milk declining due to world market factors, butter churned in California will likely also decline. 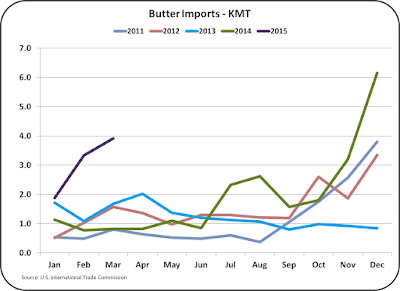 The CME futures market portrays a similar picture with butter prices remaining around $1.80 through 2016. 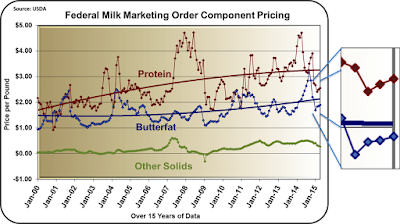 Therefore, butterfat will probably continue around the current price of $1.89/lb. The value of other solids is based on the value of dry sweet whey, which is largely an export item. 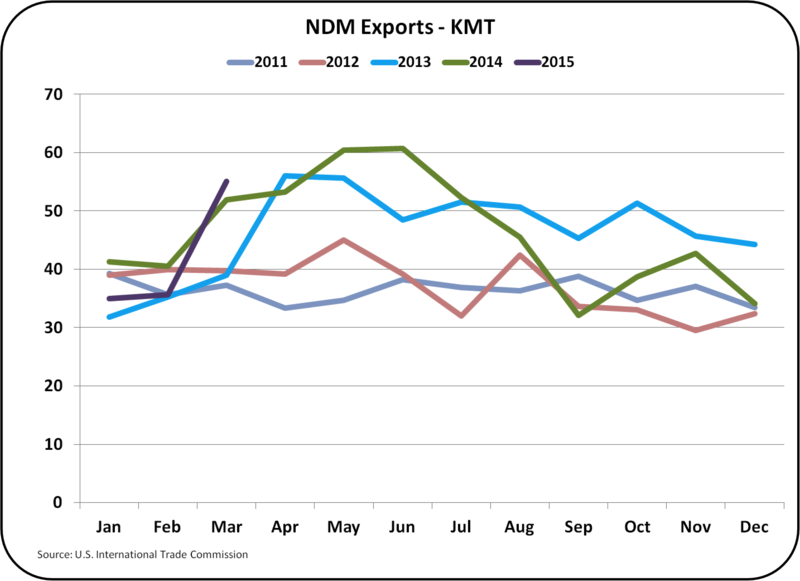 Exports have dropped from 70% of production to around 40%. Needless to say, domestic inventories have grown and prices have dropped. 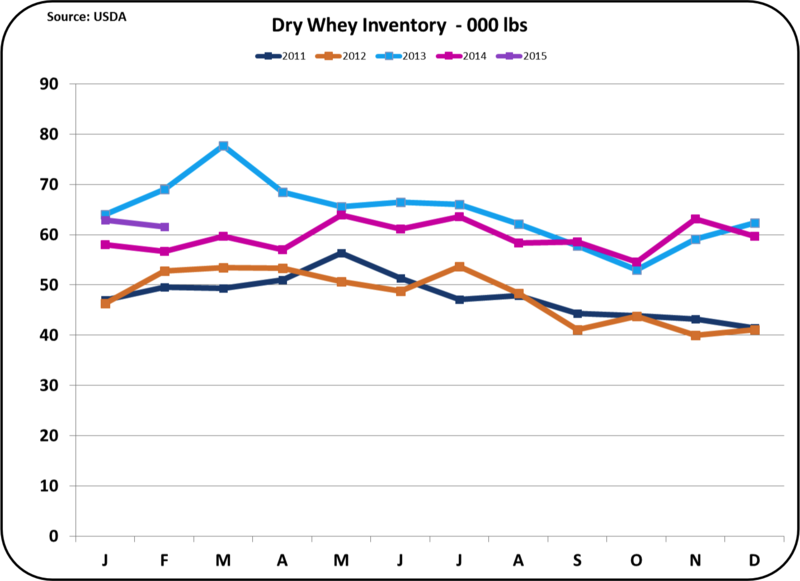 Dry whey at $.46/lb., is well below all prior year prices. 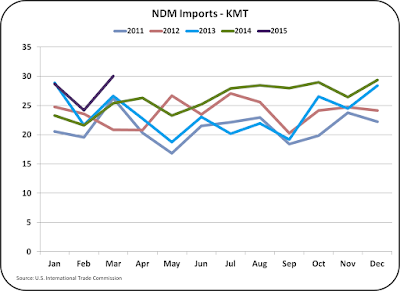 This will probably continue for some time as exports from other countries are plentiful and lower priced due to exchange rates and adequate supplies. Class III milk prices are on the rise and are expected to be above $17/cwt. by the fourth quarter of 2015. 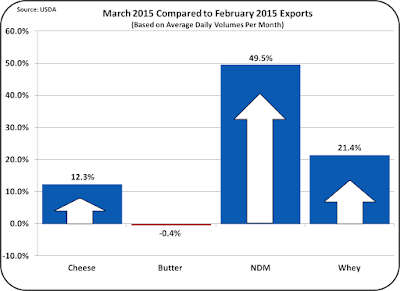 This is clearly driven by cheese prices, which are driven primarily by export volumes. The events behind these movements will be closely followed in forthcoming posts to this blog.